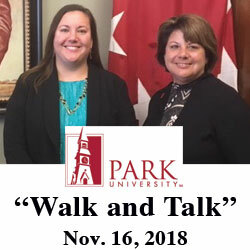 Park University reps take ‘Walk and Talk' tour | Command and General Staff College Foundation, Inc.
On Nov. 16 the CGSC Foundation hosted Lorraine Moore, Park University’s development director, and Sarah Weygand, assistant director of Park University’s Global Warrior Center, on a walk and talk tour. Sarah Weygand, left, and Lorraine Moore from Park University pause for a photo in the MacArthur Room of the Lewis and Clark Center during their Walk and Talk Tour Nov. 16. According to Foundation Director of Development Joan Cabell, the CGSC Foundation and Park University enjoy a wonderful partnership and the Foundation is always delighted to host Park University staff, faculty and board members for tours. After driving past the Buffalo Soldier monument and Grant’s statue, Moore and Weygand had the opportunity to see Fort Leavenworth’s historic brick homes, including one that was formerly the home of General MacArthur and his mom Pinky, and which holds the distinction of being the oldest continually habited home in Kansas. They also learned the stories of haunted houses and some of the friendly (and not so friendly) ghosts that still roam within. The tour continued to the old disciplinary barracks which now houses a café and gift shop, and then stopped by the famous wagon groove made by the wagons headed west in the early 1800s. Finally they drove by the National Cemetery and learned about some of the famous Soldiers buried there. 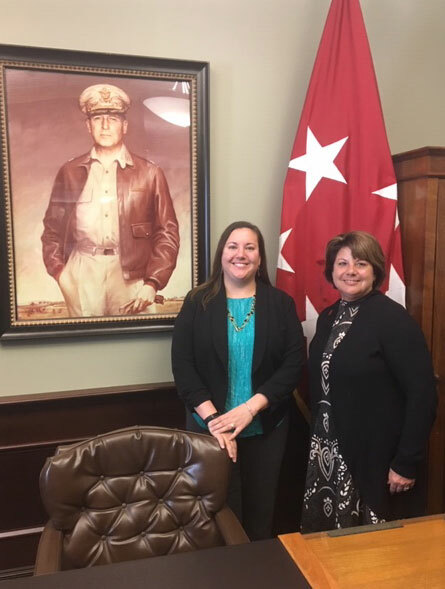 The next stop was the Command and General Staff College and the women got their pictures taken in the MacArthur room and perused the Hall of Fame. Foundation CEO Doug Tystad explained the history of the beautiful stained glass windows, as well as the art and gift collection on display given to the College by international students and others. They also had the opportunity to visit as classroom and speak with a faculty member and learn more about the curriculum in the Command and General Staff Officers Course. Their final stop was at the International Officers Hall of Fame display where they discovered the importance of the international program, and the relationships that are built that facilitate diplomatic efforts in the future. They also learned more about the sponsorship program that cements long lasting friendships between the officers and individuals in the greater Kansas City community. Park University’s tour of Fort Leavenworth and the U.S. Army Command and General Staff College was one of several visits this year by businesses and other organizations around the Kansas City region. 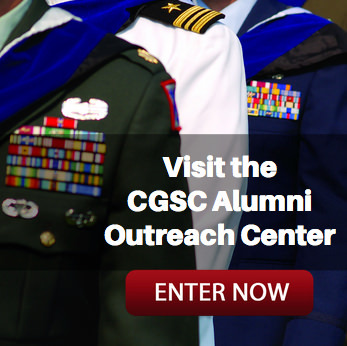 Contact Joan Cabell, the CGSC Foundation director of development, to schedule your own group’s “Walk and Talk” tour of CGSC and Fort Leavenworth and learn about the education of leaders for the nation. 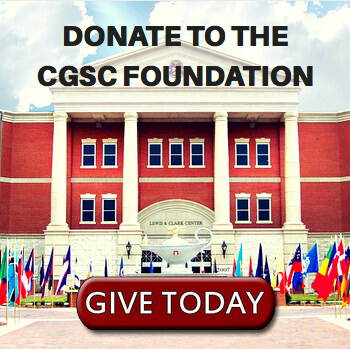 – joan@cgscf.org.